The Area 20 regulations have been updated as of October 1st, Sooke anglers can keep 4 coho, one of which can be 1 wild. This will be a relief, as some anglers were reporting ten-to-one wild to hatchery coho, so you have to catch a lot of salmon before you can keep one. The coho fishing is reported to be excellent. 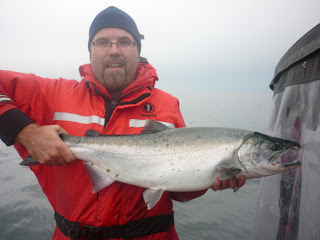 At Salty Towers, all of the boats yesterday came back with their limit of coho, in the 10-14 lb range. They were fishing from the Sooke harbour mouth west, in 200-300 feet of water, at 70-120 foot depths. These aggressive coho aren't picky, apparently biting on anchovies, spoons, or hootchies. Now's the time to get out there, and have some fishing fun!